An Cnoc is the single malt from Knockdhu distillery, and although it’s relatively low profile compared to some other Speyside malts, they’ve been quietly producing very good whiskies for some time now. Certainly the 16 year old is a perennial favourite – an excellent but underrated dram that we constantly recommend. Knockdhu previously released malts under its own distillery name, but changed over to An Cnoc in the early noughties to avoid unnecessary confusion with Knockando, while taking the opportunity to update their range to some strikingly simple, contemporary packaging. The distillery is located in the northeast of Speyside and is the most easterly Speyside distillery. 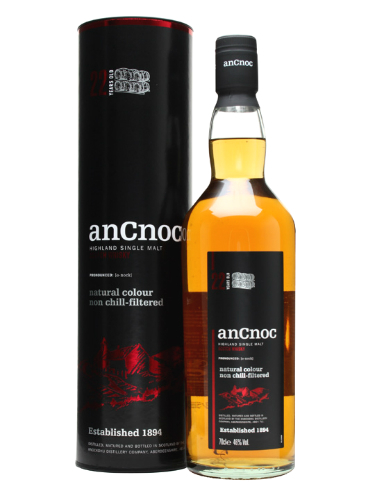 An Cnoc, though, thinks of itself as a Highland distillery and labels itself as such (which, as a Speyside it is perfectly entitled to do), and stylistically it’s arguably more akin to a northern Highland malt, with less emphasis on sherry in the standard range. This new 22 year old has just been released at a very reasonable £82.49. It’s mostly from ex-bourbon casks but there’s also some Spanish casks seasoned with Oloroso sherry for two years in the mix. Let’s see how it shapes up. Nose: Nice aromas of spicy old oak, apple crumble, sugared almonds, then hints of sherry slowly coming through with classical fruit cake and raisin notes. Evolves into something not entirely dissimilar to a Cadbury’s Fruit & Nut chocolate bar. Water brings the fruitcake aromas back to the fore. Palate: Remains very true to the nose, with toasty old oak, some worn leather and then the fruit and chocolate coming through mid-palate. Gets quite dry and earthy towards the end, reminiscent of slightly dusty leather furniture and old books. Water brings out a honey note while lifting the oakiness. Finish: Oaky and mouth-drying with earthiness and woodspices coming through strongly. Comment: I can see this being a great after-dinner dram, perhaps with a hard farmhouse cheese. Very pleasant, quite old-school Highland style. 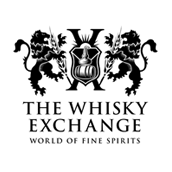 Nose: Fruit and spice off the bat – green apple chews and cinnamon, squidgy pears and a touch of green anis. Some black pepper heat lurks behind the fruit, along with some butterscotch. Palate: Soft and rounded to start, with Nice biscuits, grape jam, sour apples and crunchy pears. Then some darker flavours kick in with cinder toffee, old dark wood and a bit of tingly spice. Water brings out sweetness and more sharp but elegant wood, lots of vanilla and some sweet cream. Finish: Polished wood, apple skin and lingering cinnamon heat. Comment: A decent balance of sherry and bourbon cask flavour, although packing a bit more peppery wood than many may like. A drop of water changes things dramatically, though, hiding the spice and bringing out fruit. One to go on my ‘stronger isn’t always better’ list.